Erin Smith was a delight to work with and made what was a sad and stressful time for me, easy and fun. She made me excited to move here and she was totally right! Serena C., we strive for 100% satisfaction, and it is great to see you had such a positive experience at Post Alley Court. We are always more than happy to assist you if anything else comes up. Take care! This is a lame. I hate being asked to tell how great something is. I'd rather the apartment actually credit my rental account. Also, why 140 characters? Hi Chris, we appreciate your honest feedback, as we are always looking for ways to improve. I apologize that you unhappy with our Community Reward program. We have implemented this as a way to connect with the residents while also rewarding them for their participation. Thank you again for leaving feedback and have a great day! Overall, it has been great - but over the past 4years, we have had a lot of turnover in office and maintenance staff, which has been hard at times. Hello Breanna M., we appreciate you taking the time to leave us this feedback. I appreciate your patience during the transitions that have occurred at the property! Please don't hesitate to reach out if there's anything additional we can do for you. I work downtown and am fresh out of college. Being downtown is incredible! I feel safe and secure and when I need repairs, they are quick! The gym is nice and the laundry units work well. Love, love, love the rooftop. Hi Molly Black, we are very happy to have provided you with such a positive experience! Thanks again for taking the time to leave us this information about your recent visit. Take care! Best downtown location, with amazing price point you cannot beat it especially with all the amenities provided. The complex is very quiet for downtown living as well. Thank you again for taking the time to let us know how we did. We hope you have a great day! Please let us know if there is anything else we can do for you; we are more than happy to help! I love it here. Everyone that works and lives here is so friendly, nice and helpful. Huge plus is that they are dog friendly so not only do I feel at home so do my pups. Hi Amber S., we are very happy to have provided you with such a positive experience! Thanks again for taking the time to leave us this information about your recent visit. Take care! We appreciate your positive review about your recent experience with us! Thank you so much again for your feedback! We hope you have a great day! Love the location, very convenient and gorgeous views! Manager is great! I would recommend this beautiful property to any of my local friends in the area! 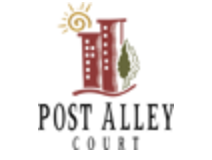 Erin S., thank you for your kind review; we are happy to pass along your comments to the team here at Post Alley Court! No complaints in regards to the noise level from other tenants. Would like to see more community events happen, this way we can build relationships. Hi Sandra D. thank you for taking the time to leave us your honest feedback. We have resident events every 2-3 months and were sad to see that you weren't able to make our Ugly Christmas Sweater Event! We are always more than happy to assist you if anything else comes up. Take care!